and shows mercy to his afflicted." 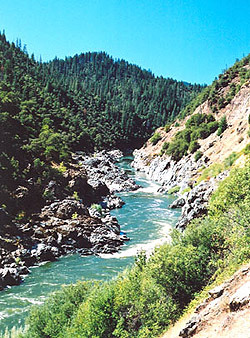 Photo: Klamath River, northern California. Photo source. A Comment to "A Place of Broad Rivers and Streams"
Beautiful post to reflect on the early scrutinies of the living water (the Samaritan woman and the man born blind healed at Siloam) and encourage us to pray for those folks being received into the Church this Easter! As Ezra interpreted the scriptures for the exiles on their return from Babylon amongst the ruins of the city walls at the Water Gate. A later interpretation ties Exodus's four rivers of Eden to the four Gospel evangelists, to Jesus through Mary as vessel of grace (a model of Mother Church ministering to our parched exile in sin outside Eden). 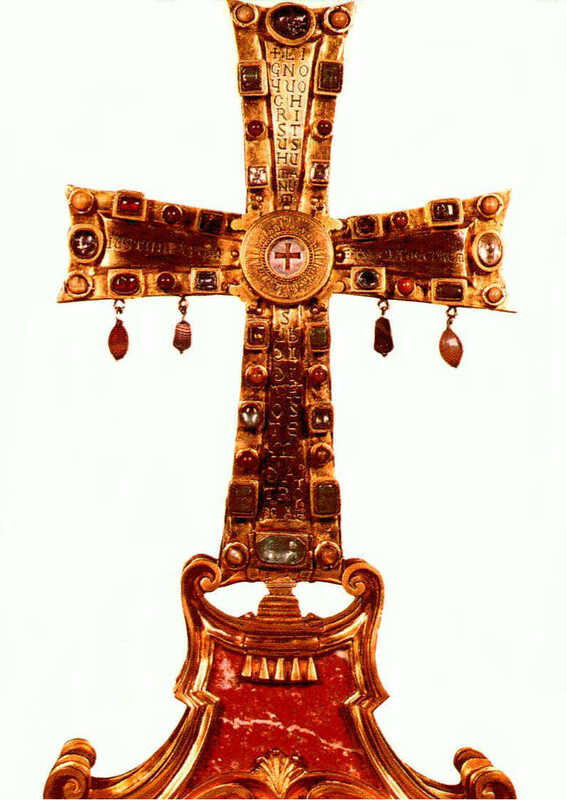 (same idea also featured in the earliest Cross in the Vatican's collection, a gift to a Pope of the 6th Century, known as the Crux Vaticana from Emperor Justin II in Constantinople, with four teardrop jewels representing the four rivers of grace of the New Testament Gospels. What's really neat is that the image the ancients depicted perhaps was based on real places that pilgrims would perhaps have been familiar with before the Arab conquests. I posted a response along these lines to Mike Aquilina's blog back in January, when he reported on excavations to aqueducts along the Western Wall in Jerusalem. Solomons Pool near Bethlehem, in an old etching, and modern snapshots (scroll down to latter half). More here. And here's a page describing the destination, the Pool of Siloam in Jerusalem. And note the direction of water flow - like an arrow pointing north through the temple, to Golgotha, where the font of mercy poured forth on the cross. Neat, eh? Let us pray fervently for peace in the Holy Land that these holy places may be made more widely known through pilgrimage tourism, and serve a deepening appreciation for the four senses in Catholic exegesis: two addressing "things below" or man's relation to man (history in real spatial relationships of place, and tropology the moral of the tale); and two "divine and heavenly things," or man's relations with God (allegory, mystical themes of unveiling deeper meaning as in flow of water in rivers, wells and vessels etc, and anagogy our final end post-eschaton) that may bring our Separated Brethren closer in common understanding, ut unum sint! This is a collection of somewhat related Scriptures about a river flowing through the City of Jerusalem or below the threshold of the temple. There is no river in Jerusalem. 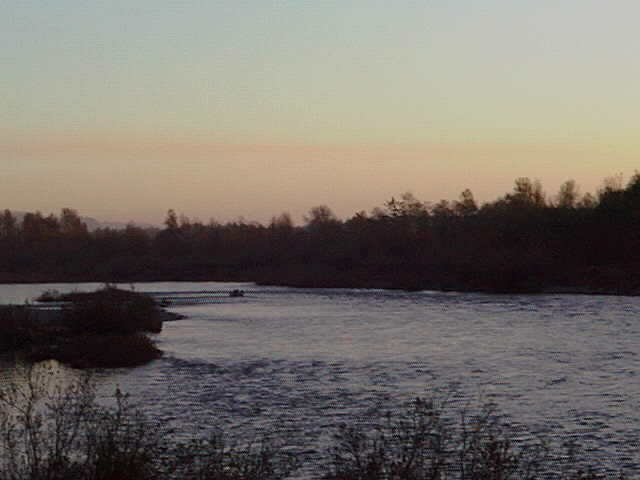 The river in Ezekial 47 (which is in tomorrow's daily readings), like the living water in Psalm 46 and other prophecies, symbolizes God's presence as the source of life and echoes the description in Genesis of the river in Eden. The "river of the water of life" (Revelation 22) flowing from the throne of God, the "living waters" flowing out of Jerusalem (Zechariah 14), the water flowing down from the threshold of the temple (Ezekial 47), symbolize the dwelling place of God and His presence there as the source of all of life. In John 10, Jesus told the woman at the well that He would give people "living water," and they would never thirst. "Then he brought me back to the door of the temple; and behold, water was issuing from below the threshold of the temple toward the east (for the temple faced east); and the water was flowing down from below the south end of the threshold of the temple, south of the altar. Then he brought me out by way of the north gate, and led me round on the outside to the outer gate, that faces toward the east; and the water was coming out on the south side. Going on eastward with a line in his hand, the man measured a thousand cubits, and then led me through the water; and it was ankle-deep. Again he measured a thousand, and led me through the water; and it was knee-deep. Again he measured a thousand, and led me through the water; and it was up to the loins. Again he measured a thousand, and it was a river that I could not pass through, for the water had risen; it was deep enough to swim in, a river that could not be passed through. And he said to me, "Son of man, have you seen this?" Then he led me back along the bank of the river. As I went back, I saw upon the bank of the river very many trees on the one side and on the other. And he said to me, "This water flows toward the eastern region and goes down into the Arabah; and when it enters the stagnant waters of the sea, the water will become fresh. And wherever the river goes every living creature which swarms will live, and there will be very many fish; for this water goes there, that the waters of the sea may become fresh; so everything will live where the river goes . . . . And on the banks, on both sides of the river, there will grow all kinds of trees for food. Their leaves will not wither nor their fruit fail, but they will bear fresh fruit every month, because the water for them flows from the sanctuary. Their fruit will be for food, and their leaves for healing." "A river flowed out of Eden to water the garden, and there it divided and became four rivers. The name of the first is Pishon; it is the one which flows around the whole land of Havilah, where there is gold; and the gold of that land is good; bdellium and onyx stone are there. The name of the second river is Gihon; it is the one which flows around the whole land of Cush. And the name of the third river is Tigris, which flows east of Assyria. And the fourth river is the Euphrates." "God is our refuge and strength, a very present help in trouble. Therefore we will not fear though the earth should change, though the mountains shake in the heart of the sea; though its waters roar and foam, though the mountains tremble with its tumult. [Selah] There is a river whose streams make glad the city of God, the holy habitation of the Most High. God is in the midst of her, she shall not be moved; God will help her right early." "Look upon Zion, the city of our appointed feasts! Your eyes will see Jerusalem, a quiet habitation, an immovable tent, whose stakes will never be plucked up, nor will any of its cords be broken. But there the LORD in majesty will be for us a place of broad rivers and streams, where no galley with oars can go, nor stately ship can pass. For the LORD is our judge, the LORD is our ruler, the LORD is our king; he will save us." "On that day living waters shall flow out from Jerusalem, half of them to the eastern sea and half of them to the western sea; it shall continue in summer as in winter. And the LORD will become king over all the earth; on that day the LORD will be one and his name one." "Then he showed me the river of the water of life, bright as crystal, flowing from the throne of God and of the Lamb through the middle of the street of the city; also, on either side of the river, the tree of life with its twelve kinds of fruit, yielding its fruit each month; and the leaves of the tree were for the healing of the nations. There shall no more be anything accursed, but the throne of God and of the Lamb shall be in it, and his servants shall worship him; they shall see his face, and his name shall be on their foreheads. And night shall be no more; they need no light of lamp or sun, for the Lord God will be their light, and they shall reign for ever and ever." "Jesus answered her, "If you knew the gift of God, and who it is that is saying to you, 'Give me a drink,' you would have asked him, and he would have given you living water." The woman said to him, "Sir, you have nothing to draw with, and the well is deep; where do you get that living water? Are you greater than our father Jacob, who gave us the well, and drank from it himself, and his sons, and his cattle?" Jesus said to her, "Every one who drinks of this water will thirst again, but whoever drinks of the water that I shall give him will never thirst; the water that I shall give him will become in him a spring of water welling up to eternal life."" 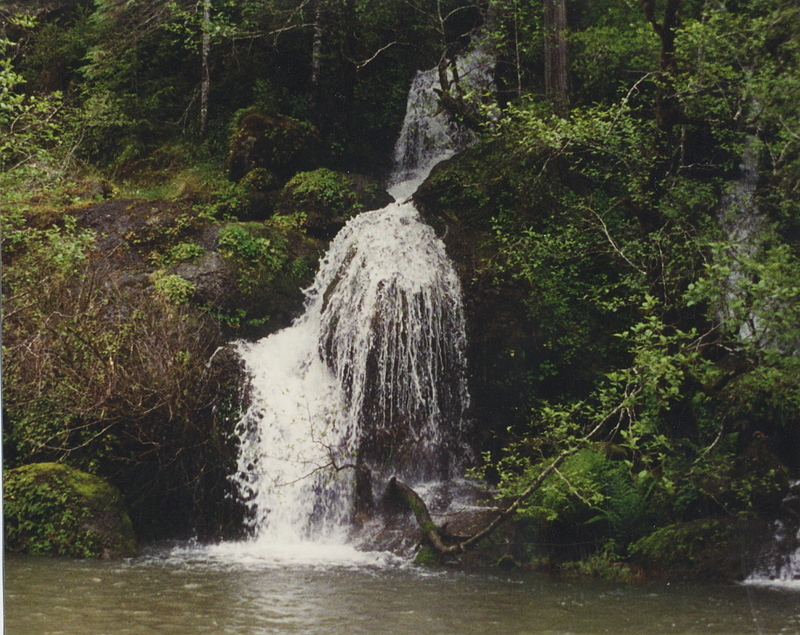 Photo: Smith River, near Crescent City, northern California. Source. Today, the last day of Christmas celebrations, Pope Benedict XVI baptized 13 newborn babies in the Sistine Chapel in a Mass to celebrate the feast of the Baptism of Our Lord. It is the second oldest feast of Christian tradition, following Easter. Afterward, he again mentioned baptism in his meditation before praying the Angelus with a crowd gathered in St. Peter's Square. In his homily, he spoke about the symbols of baptism, including water, a sign of maternity in many religions, and the fire of the Holy Spirit. He distinguished the sacrament of baptism from magic. In his meditation before the Angelus, he spoke about the effect of the sacrament of baptism. "In all religions, water is a sign of maternity. And for the Fathers of the Church, water became a symbol of the maternal womb of the Church.” In baptism, we are united “to the heavenly Father” in “God’s family” and this link with Him is expressed in the relationship with the Mother-Church: “In Baptism, we are adopted by the heavenly Father but in this family there is also a mother, the Mother Church." 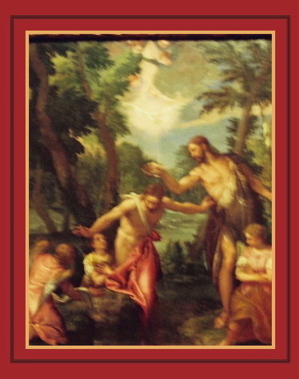 "There is a close relationship between the Baptism of Christ and our own Baptism. 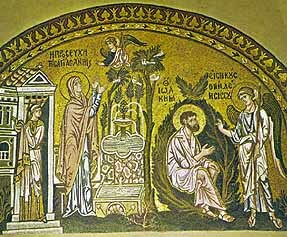 At the Jordan, the heavens opened (cfr Lk 3,21) to indicate that the Savior has opened to us the way of salvation and that we can walk along it, thanks precisely to our new birth 'in water and the Spirit" (Jn 3,5) which is realized in Baptism." Picture: The Baptism of Christ, by Paolo Veronese, 1580-1588 (museum information). "Gathered this morning in this house of prayer consecrated to the Lord, how can we not evoke the other fine image that Saint Paul uses in speaking of the Church, the image of the building whose stones are closely fitted together to form a single structure, and whose cornerstone, on which everything else rests, is Christ? He is the source of the new life given us by the Father in the Holy Spirit. 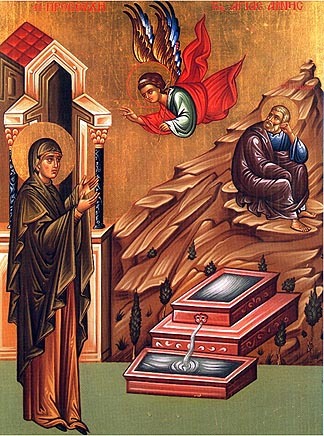 The Gospel of Saint John has just proclaimed it: "out of his heart shall flow rivers of living water". This gushing water, this living water which Jesus promised to the Samaritan woman, was seen by the prophets Zechariah and Ezechiel issuing forth from the side of the Temple, so that it could make fruitful the waters of the Dead Sea: a marvellous image of the promise of life that God has always made to his people and that Jesus came to fulfil. In a world where men are so loath to share the earth’s goods and there is a dramatic shortage of water, this good so precious for the life of the body, the Church discovers that she possesses an even greater treasure. As the Body of Christ, she has been charged to proclaim his Gospel to the ends of the earth (cf. Mt 28:19), transmitting to the men and women of our time the Good News which not only illuminates but overturns their lives, even to the point of conquering death itself. This Good News is not just a word, but a person, Christ himself, risen and alive! By the grace of the sacraments, the water flowing from his open side on the Cross has become an overflowing spring, "rivers of living water", a flood that no one can halt, a gift that restores life. How could Christians keep for themselves alone what they have received? How could they hoard this treasure and bury this spring? The Church’s mission is not to preserve power, or to gain wealth; her mission is to offer Christ, to give a share in Christ’s own life, man’s most precious good, which God himself gives us in his Son." - Pope Benedict XVI, Homily at the Cathedral of the Holy Spirit, Istanbul, December 1, 2006. "My love has been crucified, and there is no fire in me desiring to be fed; but there is within me a living water that is speaking, saying to me inwardly, 'Come to the Father.' I have no delight in corruptible food, nor in the pleasures of this life. I want the bread of God, the heavenly bread, the bread of life, which is the flesh of Jesus Christ, the Son of God, who became afterwards of the seed of David and Abraham; and I want the drink of God, namely His blood, which is incorruptible love and eternal life."